UKIP is outpolling the Lib Dems by more than 2 to 1 and more importantly, would hold the balance of power if the polling turned into actual vote share in the next general election. In Survation's latest poll for the Guardian, Labour are still out in front on a slightly diminished 39% with the Tories in second place on a record low of 27%. 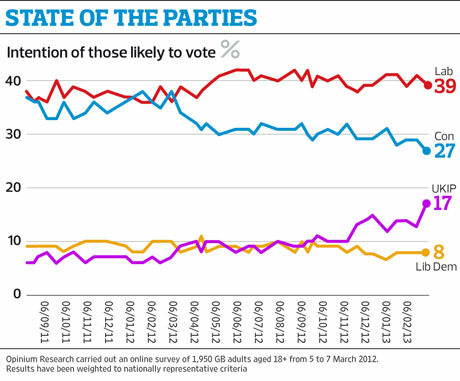 UKIP are third with a projected 17% of the vote with the Lib Dems trailing in 4th place with just 8%. It means that for the first time the only way the Tories could form a government would be with UKIP's help. I'm not suggesting that UKIP should form an electoral pact with the Tories - I would never support such a move unless UKIP was the majority partner - but supporting a minority Tory government on a policy by policy basis would put UKIP in an extremely powerful position.